What timber of decking do you use? …and many more. Please see our ‘Types Of Decking’ page for more information. Do you supply composite decking? Yes we do, we supply all the leading brands of composite decking in a variety of finishes and sizes. If you want a product which you don’t have to maintain, composite boards are a good choice. Ideal for use next to the ocean or swimming pool. We have been in the deck building industry for over 20 years, installing thousands of decks, more than 1000 in the last 5 years alone in the residential and commercial sector. Can you design a deck for me as I’m not too sure what will work best? Absolutely! We provide a free design service, with many years experience we have a very good idea of what could work best for you, taking into account such things as childrens safety, storage and seating areas, staircases, and maximising the potential so you get the very best deck for your home. Do you install deck lighting? Yes we have a fully licensed electrician who can design a lighting system to beautifully compliment your new deck, including deck step lights, floor lighting, and we offer a range of stainless steel deck lights built to withstand the Australian climate. It can take as little as a few days for the smaller simpler designed designs to several weeks for the larger more intricate decks. Are all your workers fully licensed and insured? Yes all our employees are licensed and insured and we don’t use subcontractors. All are trained to the highest standard and are focused on providing you with the very best customer service. We have $20 million public liability insurance and are registered contractors with the New South Wales Office of Fair Trading, licence number 256662C. Will I need to be in all day to oversee the work? Not if you don’t want to be, we can provide our own portaloo and washing facilities upon request and are fully self sufficient. Are your timbers sourced sustainably? Yes we only buy our timber from suppliers who in turn buy their timber from fully certified and accredited sustainable suppliers. Do you provide a deck maintenance service? Yes we do, we offer cleaning, sanding, resealing, staining and polishing to all existing and new customers. Full sanding will restore your deck back to its original beauty. Stripping and resealing will revitalise your deck, bringing it back to life and is a more economical option than full sanding. Do you build decks in Bush Fire Zones? Yes we have built many decks in bush fire and flame zones, offering a range of boards including aluminium,cement,and Modwood Flame Zone which is suitable for use BAL 40 zones. Our experience in these decks means we are familiar with all the requirements and certification required for building in Bush Fire Zones. Can you get council approval for me as I m not sure how to go about it? Absolutely we can take care of every aspect from start to finish, drafting plans, DA submissions to your council,building the deck arranging a private certifier,let us take the stress out of the process for you, we ll ensure a smooth hassle free approval for your deck at very competitive prices. Do you only build decks? We also specialise in Pergolas, Privacy Screens, Bench Seats, Staircases, Balustrades and Planter Boxes, we offer all of these in a range of materials such as hardwoods, powder coated aluminium, stainless steel and glass. 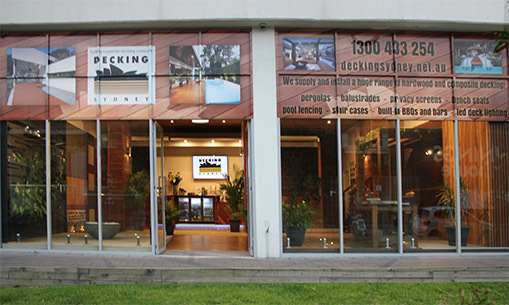 Why should we use Decking Sydney? Simply put, we believe every customer should be treated as a valued client, not just a number. We pride ourselves on building every deck to the same high standard we would want if someone was working on our own homes. We treat every customer the way we’d like to be treated. Simply give us a call us or Contact Us for a free no obligation consultation.